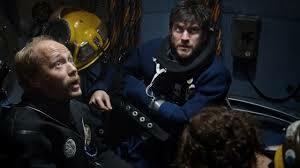 Pioneer is a white-knuckle drama about deep-sea divers laying undersea oil pipeline, and the early scenes evoke any number of submarine movies: metal groans under enormous undersea pressure, sweaty people eye bulkheads nervously, hoping they don’t collapse, and tough guys bet everything on making it out alive one more time. The oil company that employs them applies pressure of its own: they aren’t afraid to cut corners in order to make deadlines, and they offer money aplenty to get what they want. Petter (Aksel Hennie) is part of the American / Norwegian crew working on a new oil project in the North Sea. When one of the men is killed in an industrial accident, Petter is blamed; in trying to clear his name he uncovers a sinister conspiracy and the movie switches gears quickly, becoming a 70s-style paranoid thriller — only appropriate, since the movie is set in that era and is loosely based on actual events. Pioneer screens Monday and Tuesday, March 3 and 4 at 7:00 and 9:15 at the Trylon. Advance tickets can be purchased here.